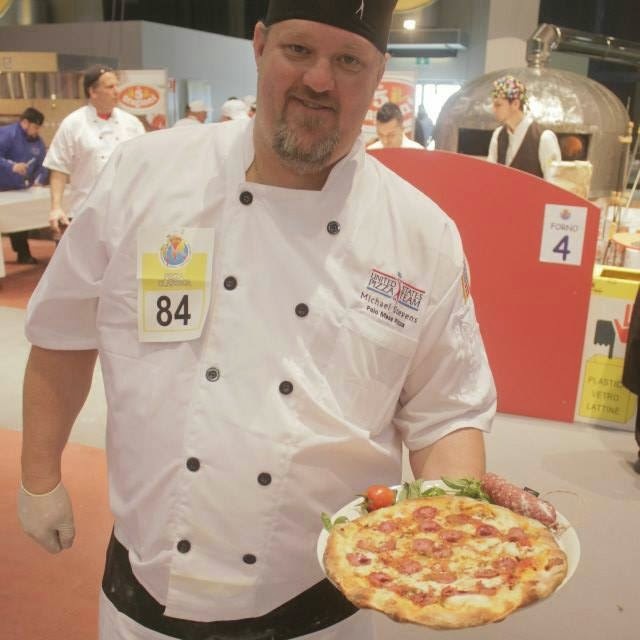 Michael Stevens of Palo Mesa Pizza competed in Italy. Michael Stevens of Palo Mesa Pizza has three pizzerias and runs the social media for each one but he makes sure to include his employees in getting the message out. MS: All my employees are involved. PMQ: What do you have to do different on social media when you own more than one store? MS: You have to do the same stuff but we just have to make sure all stores have what they need for whatever it is we are promoting. PMQ: When did your third store open? Where are the other two and how long have they been open? MS: Third store opened May 20th, second store is in Arroyo Grande, 20 minutes from third store, opened a year and a half ago, and store number 1 opened in 2007 in Arroyo Grande, ten minutes from #2. MS: I post whenever I can in my spare time. I'm getting better at it. I'm not sure I'm convinced social media works real well for me in Arroyo Grande but I hope the college town of San Louis Obispo for the new store embraces it. MS: It is about frequency and just being you. MS: We do our own but might look into hiring out soon. MS: Just do what you can do. It only takes 5 minutes. Take a picture and post, or just share with your friends about the specials or what is new. Just do what you can! MS: I do know that people in general want to be apart of something so provide that experience.